30mm Bushmaster II. Photograph copyrighted by Alliant Techsystems. The 30 mm Bushmaster II is derived from the proven 25 mm M242 Bushmaster automatic weapon. This next-generation member of the Chain Gun® family applies the same design simplicity, positive round control, ease of maintenance and constant velocity ammunition feed of the battle-proven Bushmaster cannon. The Mark 46 system is a navalized version of the gun used on the Advanced Amphibious Assault Vehicle (AAAV) and on the San Antonio LPD-17 class. The larger 30 mm Bushmaster II incorporates 70 percent of the logistic parts used in the 25 mm M242 Bushmaster, offering operators low-risk, proven performance and NATO common parts supply. The production barrel will be chrome plated for extended life. The mounting for this weapon will be shared with the Expeditionary Fighting Vehicle (EFV) - formerly known as the Advanced Attack Amphibious Vehicle (AAAV) - being built for the US Marine Corps. From the LPD-17 website: "The Mk 46 30 mm gun system is a two-axis stabilized chain gun that can fire up to 250-rounds per minute. 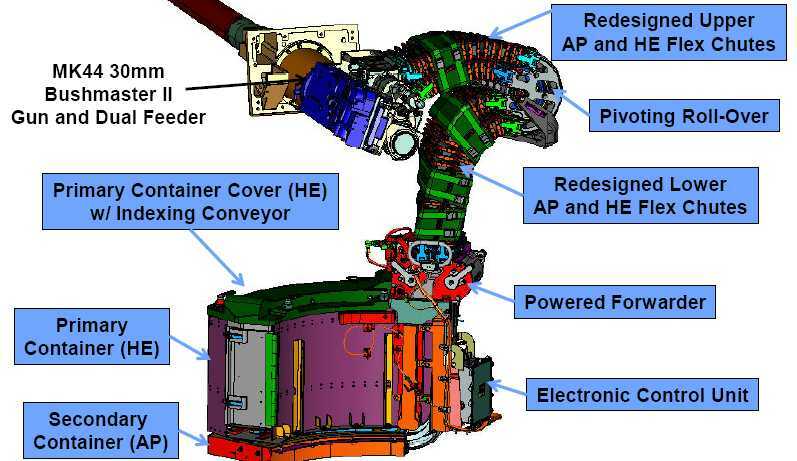 The system uses a forward looking infrared sensor, a low light television camera, and laser range finder with a closed-loop tracking system to optimize accuracy against small, high-speed surface targets. It can be operated locally at the gun's weapon station (turret) or fired remotely by a gunner in the ship's Combat Information Center." This weapon can be converted to fire 40 mm rounds with a change of barrels and minor changes to the feeder assembly. This conversion can be performed by the ship's crew. A 15 September 2005 Alliant Techsystems (ATK) Press Release announced that ATK "will provide its proven 30/40 mm Mk44 Bushmaster Cannon system to MSI Defence Systems for integration onto its DS30M Mk2 Naval Mounting. The UK Royal Navy (RN) has ordered a total of 26 systems for the new Type 23 Frigate, with deliveries scheduled to begin in late 2006. This is the first time ATK will provide the Bushmaster for use on a RN vessel and it extends the Bushmaster's reach beyond armored vehicle applications to shipboard use." MSI supplies these weapon systems to many countries and has also won a contract to supply 30 mm systems to ThyssenKrupp Marine Systems (TKMS) for use on their MEKO-type frigates. These 30 mm weapons replaced the 57 mm Bofors guns planned for the USS Zumwalt DDG-1000 class. Weapon may be set to fire in single shot, 5 round burst or fully automatic modes. This weapon fires standard 30 x 173 mm GAU-8 ammunition, using a side-stripping link developed by The Boeing Company. It can also fire RARDEN and Oerlikon KCB (30 x 170 mm) ammunition by changing the barrel, bolt and aft feed plate. The major difference between the HEI-T Mark 266 Mod 1 and Mark 238 Mod 1 is that the Mark 266 Mod 1 uses a non-self destruct fuze (NSD) while the Mark 238 Mod 1 uses a self-destruct fuze (SD). The navalized Mark 46 Mod 1 mounting has a dual feed magazine with 200 rounds in each feed. - The choice of either remote unmanned operation or local 1-man operation by a single crewman. - No exterior hatches or periscopes. - No coaxial secondary weapon. - Higher ready-round capacity than the armor variant. - Use of Low-Light Television (LLTV) for target acquisition. This weapon uses a 1.0 HP motor @ 24 VDC to operate all moving components. MSI uses a similar mounting for the 30 mm KCB cannon. Photograph copyrighted by Alliant Techsystems. Installing a Mark 46 Mod 1 weapon system onboard USS San Antonio (LPD-17) in November 2005. 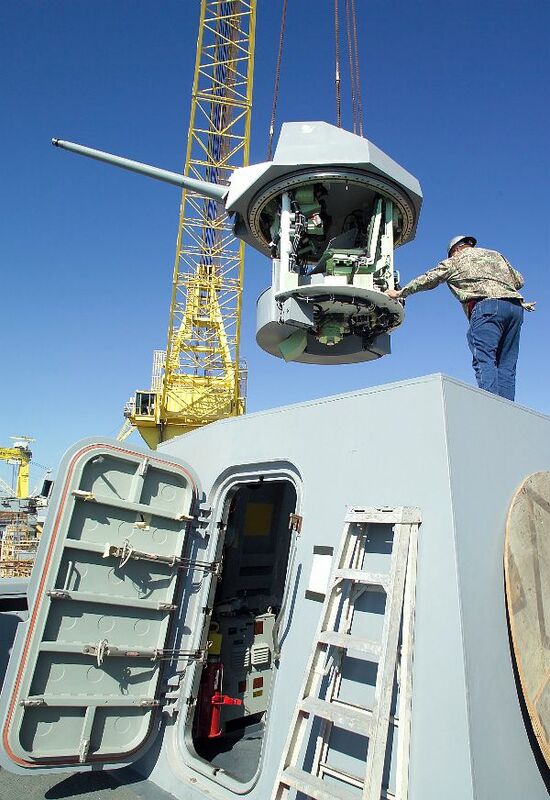 This same mounting is used on USS Freedom LCS-1 and planned for the USS Zumwalt DDG-1000 class. US Navy photograph 051026-0-0000B-001. 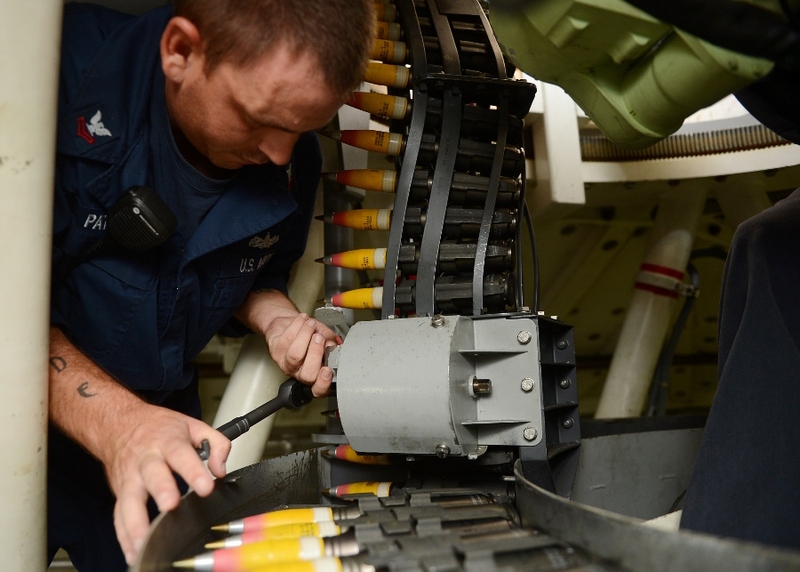 Ammunition for the Bushmaster II. 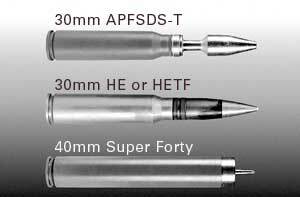 Note that the 40 mm round is the same overall length as the 30 mm rounds, thus simplifying the changeover to the larger caliber. Photograph copyrighted by Alliant Techsystems. 30 mm ammunition feed system for Mark 46. Mounting on USS Freedom LCS-1. Cutaway view of Mark 46 Mounting showing dual-ammunition feed system. Image copyrighted by General Dynamics ATP.